In my neck of the woods, the coastline of Massachusetts north of Boston, an area locally referred to as the North Shore, our maritime heritage is still a large part of our local identity. When Jennie and I visited her family in Chippewa County, Wisconsin, the area's logging history played a similar role. Jennie was born in Chippewa Falls less than a mile from the Leinenkugel's Brewery, but her hometown is Cornell, Wisc. The largest and most prominent landmark in Cornell is a massive pulpwood stacker that still stands along the banks of the Chippewa River. The stacker was used to stack logs that would be used in the production of paper. 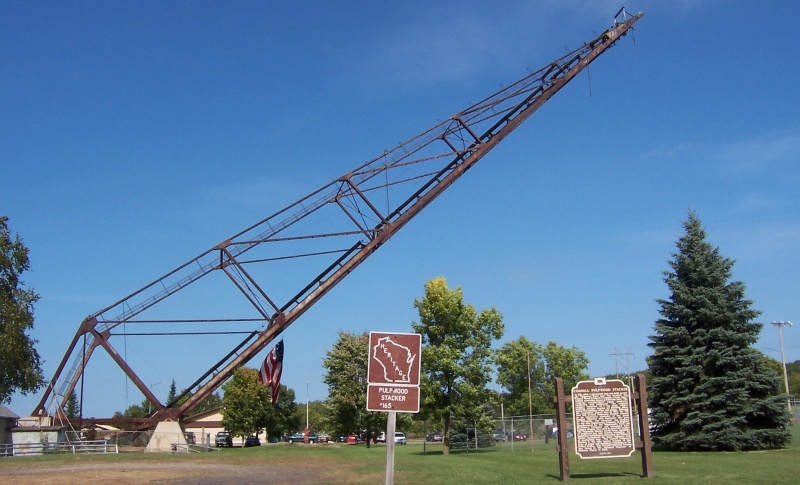 Once common, the stacker in Cornell is the only one of its kind still standing in the United States. While the stacker may be the symbol of Cornell, the brewery is the most prominent landmark in the region. "Crafty" or not I enjoy many Lienenkugel beers, but my favorite might be the Creamy Dark which helped inspire one of my early batches on the blog. In Massachusetts Creamy Dark is usually only available in the winter sample pack, and this winter it isn't even featured in there. With availability that limited locally I have wanted to brew a beer in the style of Creamy Dark for awhile. The reason I haven't brewed a dark lager to this point is that I haven't been able to brew true lagers for awhile. A lager requires that the beer ferment at around 50F, and traditionally it is stored (lager in German means "to store") at even colder temperatures for an extended lagering period. The various vintages and permutations of Pa's Lager have used a California/San Francisco Lager yeast that ferments at ale temperatures, but none of the batches were lagered in the traditional way. My plan to ferment the beer at the proper temperature and to use a more traditional lager yeast is to place my fermenter in Andy's shed to take advantage or cold ambient temperatures. To make sure the fermenters don't get too cold I planned to use a heat wrap attached to a temperature controller. As long as temperatures don't drop below 20F for an extended period this setup should work perfectly. I put together a recipe for a 5-gallon partial mash. My mash consisted of 6-row barley, flaked maize, and a touch of de-bittered black malt for color. The extract was Pilsen dry malt extract which will give the beer a blend of 6-row and 2-row which I could compare to my recent batch of Courageous Kevin's Cream Ale. Everything went great on brew day at first. My mash temperature was on point. I had a nice rolling partial boil with a very nice cold break. I made 3-stage yeast starter to build up enough cells. Everything was sailing along until I was topping up with water to get up to five gallons until I saw the bag of dry extract still sitting on my kitchen table when it should have been in my beer! It was late in the day and I needed to stop brewing and start cleaning. All I could do is seal my fermenter until I had time to boil the extract, cool the extract, and add it to the fermenter. While the fermenter was sealed, there was still air in the head space. By the time I boiled the extract and opened my fermenter there was a light aroma of sulfur and the beginnings of a krausen forming. A taste confirmed that the beer had spoiled. All that work literally down the drain.